What kid doesn’t enjoy mucking about in the snow! Sledging, building snowmen, snowball fights, kids young and old love the stuff! But unless you live somewhere that enjoys regular snowy winters, snowshoeing won’t necessarily be an activity that you are familiar with. It is however an activity that is perfectly suited to families that love being outside in the winter. Snowshoeing – the perfect family adventure? Snowshoeing really is one of the most family-friendly winter activities out there. It’s a sport that’s open to all as you don’t need any special skills or a high level of fitness to do it. 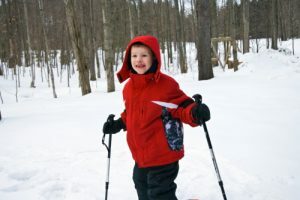 They say that if you can walk you can snowshoe and with snowshoes available in children’s sizes as well as adult’s there’s no reason why even the youngest can’t enjoy the sport. What’s more, it’s a low risk activity so if you happen to fall over then, hey, you have a super soft landing don’t you! Snowshoeing is also incredibly good value for money which, is obviously a key consideration if you’re on a budget. Here in the Pyrenees you can hire snowshoes from just about every outdoors shop in the area for under €10 a day. If you opt for a guided snowshoeing outing then snowshoes are always provided. Snowshoeing enables outdoor loving families to explore a snowy winter wonderland under their own steam. Breathe in the crisp, pure mountain air and discover a world of Nature to boot. What’s not to like! 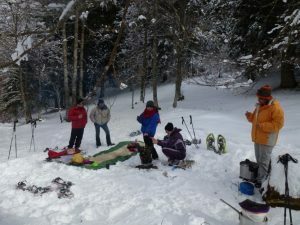 The most important thing to take into account when snowshoeing as a family is everybody’s comfort. We recommend warm, lightweight layers that you can easily add and remove. Top them off with a good waterproof jacket and trousers which will keep you dry and comfortable all day. Avoid moans of cold, wet feet by wearing insulated and waterproof or, at the very least, water resistant footwear. We’d also highly recommend wearing a pair of gaiters on your lower legs which will prevent snow from going into your boots. One of the most common snowshoeing discomforts is from pressure points caused by straps on the snowshoes that have been synched up too tight. It’s therefore a good idea to check them regularly, especially as your feet may swell as you walk. Once you’re underway, stop after 15 mins to make sure everybody is warm and comfortable. If you nip any discomforts in the bud quickly you should have a hassle free family snowshoe outing. Don’t forget to take sunglasses and sunscreen and especially lip salve to avoid burnt lips from the sun reflecting on the snow. Lastly, when snowshoeing with children you can expect to make frequent stops. So take plenty of snacks and also why not a flask of hot chocolate for a treat en route. Today’s youngsters don’t generally have a long attention span but thankfully snowshoeing provides plenty of opportunities for keeping them engaged. If you have tweens or teens, put them in charge of taking pics or videos which they can share with their friends. 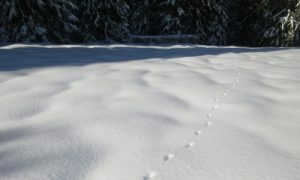 Look out for animal tracks in the snow. Take a photo, measure the tracks with a tape measure and record the observation in a notebook. Ask the children what animal they think made the tracks then look it up when you get home. Keep an eye out for pine cones that are lying on the ground and guess which animals/birds may have nibbled them. Let their imaginations run riot as they ponder rub marks and scratches on tree trunks – have they been made by the resident Pyrenees bears, I wonder?! 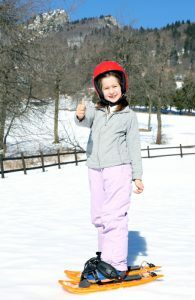 Suggest the children write a journal, recording what they have seen and done on their family snowshoe outing. It’ll be a great way for them to remember their adventures once they’ve returned home. 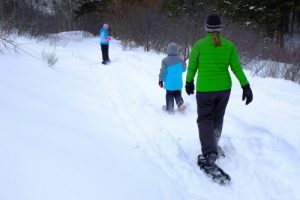 If you’re new to snowshoeing and have older children who love the outdoors then a back-country snowshoeing adventure with a local guide will be a memorable experience. The big advantage to using a local expert is that they will know the best off-grid areas to explore. They will also very much have your safety in mind and will avoid those areas where there may be a risk of avalanche. Local guides are also experts in local wildlife. Those animal tracks I mentioned earlier? You can count on your local snowshoe guide to not only identify them but to tell you all about the life of the animal in the Pyrenees. If you’d prefer a self-guided family snowshoe adventure then head for the safe environment of the waymarked tracks around the ski resorts. At one of our small, family-friendly ski resorts in the Pyrenees you can hire a pulk (a nordic sledge) packed with everything you need to enjoy a delicious chocolate fondue en route. Or why not enjoy the full Davy Crockett experience and snowshoe to a mountain cabane where you’ll be treated to a hearty, delicious meal cooked over an open fire. Then, with a satisfied tummy you’ll don the snowshoes again to return to the starting point, your way lit by the light of flaming torches! Who knows what wildlife you may disturb as you make your way back along the snowy track. The kids won’t forget this sort of family snowshoeing adventure for a long time! 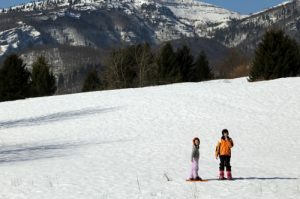 We offer a whole host of exciting family snowshoeing adventures, including the pulka and Davy Crockett experiences, on our family winter multi activity holidays in the French Pyrenees. For more tips and tricks for your next snowshoeing adventure, check out this blog post which contains lots of advice that we’re sure you’ll find useful. You can also find the ultimate snowshoeing kitlist here.